One of the things I love most about summer are the fresh berries and one of the things I like most to do with fresh berries is to bake them into sweet bubbly fruity crisps. Thankfully my kids disappeared into my parents berry patch the other night and came back with buckets of beautiful Ollalie berries. After devouring them by the handful and scattering them over waffles, there was still enough for a Father’s Day crisp. 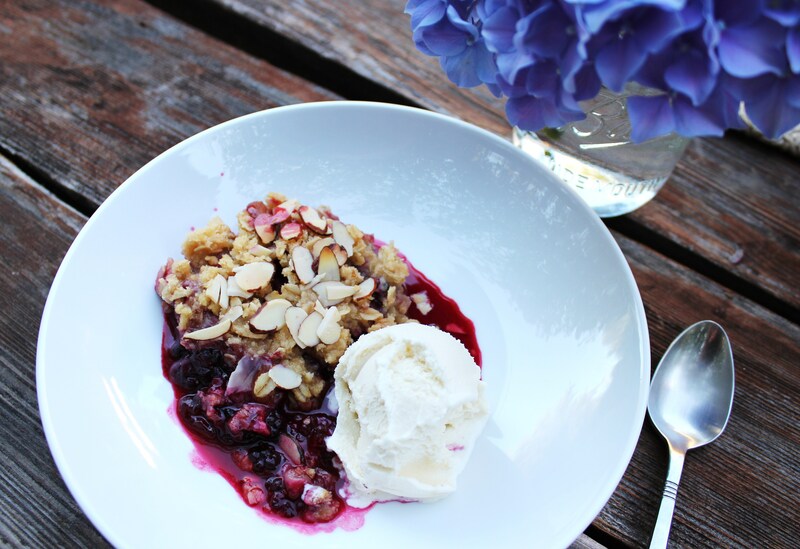 The perfect dessert to cap off a perfect summer adventure day in the canoe and swimming in the lagoon. 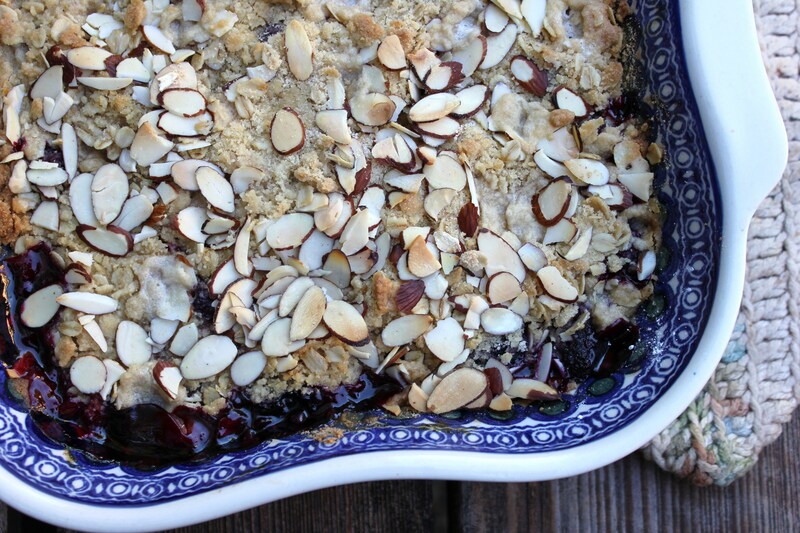 Ollalie Berry Basil Crisp is one of the simplest yet satisfying desserts that summer can afford. Ollalie berries are similar to boysenberries, so you can use those or blackberries, or even blueberries if that is what you have on hand. The basil, an unexpected ingredient, blends beautifully with the sweet berries adding just a hint of herb. 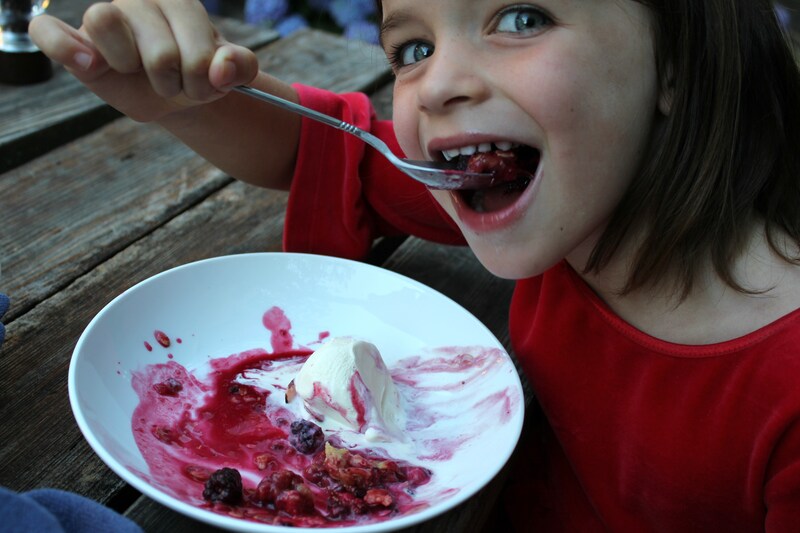 The crunchy top is the perfect counterpoint to the sweet saucy berries and of course the dollop of ice cream. 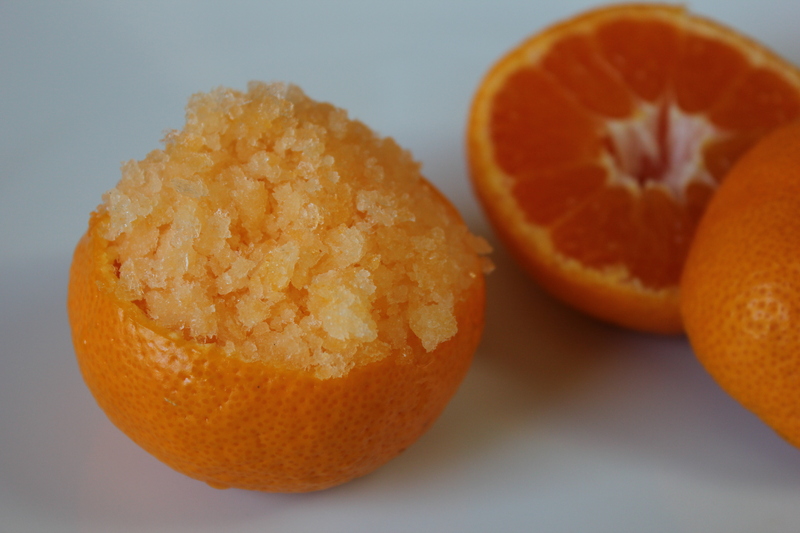 This dessert was a super hit with my family. EVERYONE had seconds. 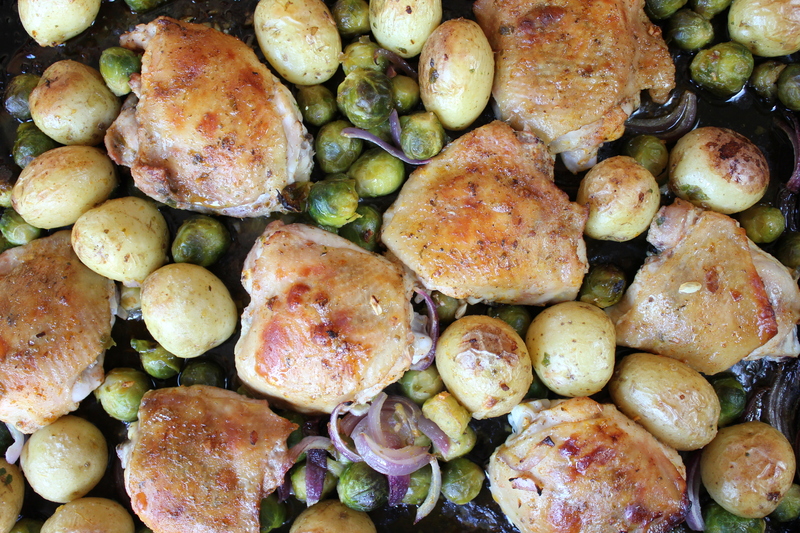 Oven Roasted Chicken Thighs with Potatoes and Brussels Sprouts could not be easier. Make a quick paste of garlic, oil, salt, and herbs to rub over the chicken. Toss the potatoes and vegetables with oil, salt and pepper, then slide the whole thing in the oven and walk away. Plenty of time to help the kids with homework, referee the driveway soccer game, coax the children out of the highest branches of the tree, or if your life is a bit more relaxing than mine, enjoy a glass of wine and a chapter of your favorite book. The chicken roasts up tender with the crispiest of skin. The potatoes and vegetables cook perfectly in the rendered chicken fat. Next time I will make this with thighs and drumsticks to appease the little man of the family. The dish is not only a great weeknight treat, but would be a fantastic dish to serve for company since all the work is done in advance. Though it pains me to acknowledge, there are not one, but two members of my family that are not die hard lovers of chocolate. 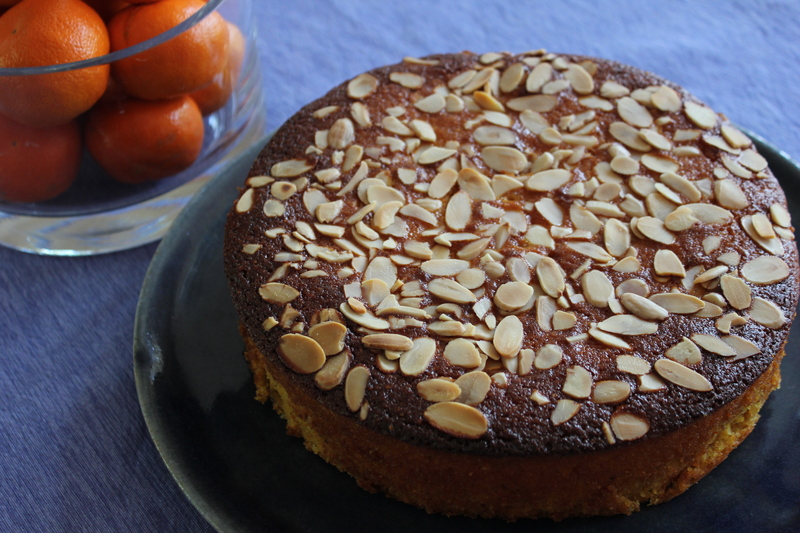 Being that cooking desserts without chocolate is somewhat foreign to me, I have taken it upon myself to find recipes for treats that not only please my family, but that I deem worthy of the calories they impart. 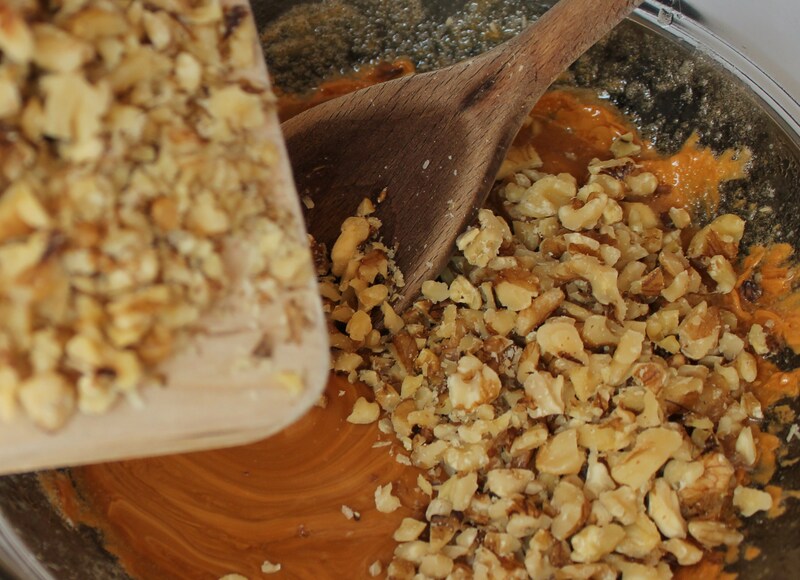 Anything caramel is usually a hit with us- we love Caramel Sauce on Vanilla Ice Cream, Caramel Apple Tarts, or fruity desserts such as Meyer Lemon Pudding Cakes. Most recently I was searching for a recipe that would pack well for a family picnic and I came across this gem of a recipe in a cookbook I recently picked up, Maida Heatter’s Cookies. 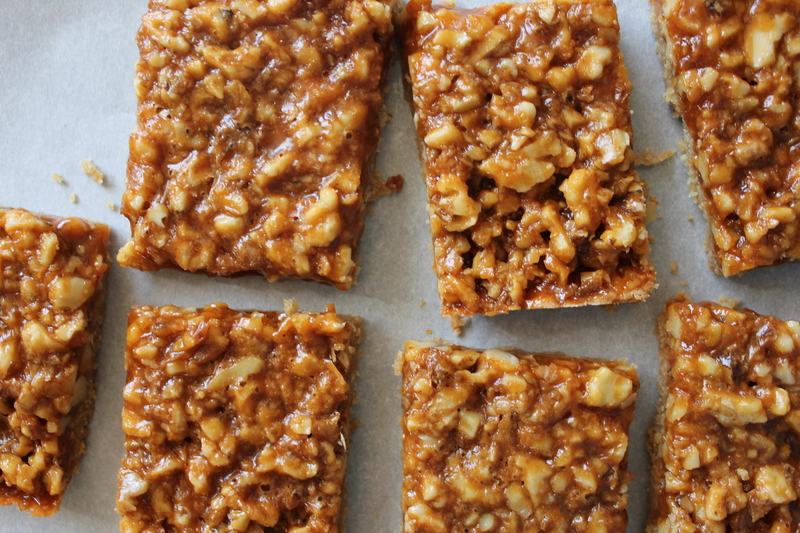 Butterscotch Walnut Cookie Bars are crunchy, nutty, butter goodness. 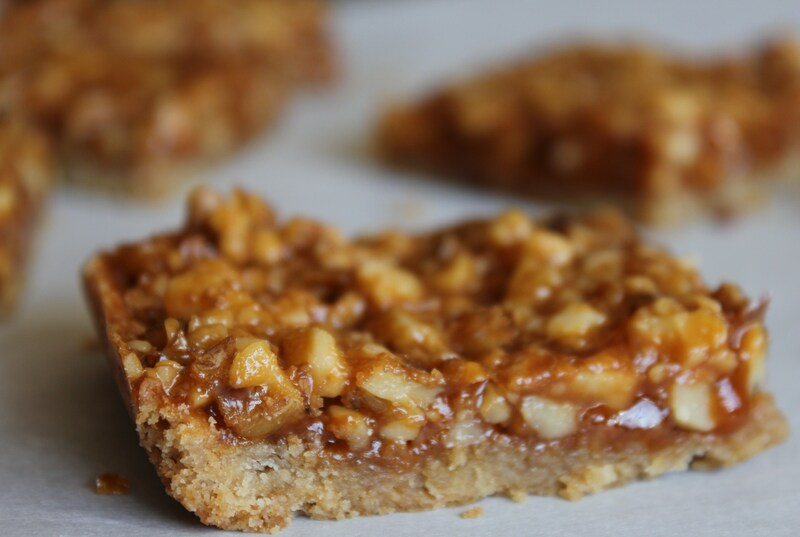 The brown sugar sweetened bottom layer holds the chewy, crunchy walnut topping. Delicious on their own, these bars are absolutely incredible with a scoop of Vanilla Ice Cream. Kept in an air tight container, these bars keep for a week, but only if you have more self-control than we do. Enjoy. My first grade son was recently asked to write up a favorite family recipe to share with his class. The minute I heard this my mind began scanning the many recipes that he might deem worthy. 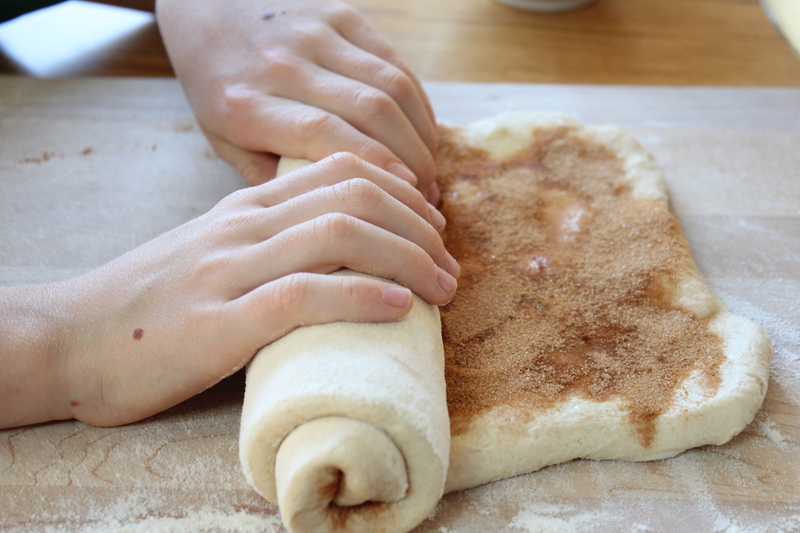 While selecting just one recipe seemed daunting to me, he quite simply stated, “I will share the recipe for Grandma’s Cinnamon Bread.” The special bread that my mom makes for him when he stays at her home. This made me think, it is the children of the family that ultimately decide which recipes will live on. Perhaps this is because in childhood every moment seems larger than life. The meals we eat, the people who prepare them for us, the experiences we have in our youth become the foundation of our life. In truth, if I think of my own favorite family recipes, they are the ones fell in love with as a child, the Swedish Cardamom Bread at our holiday table, my grandmother’s Royal Danish Soup, or my mother’s spaghetti sauce that I could never get enough of. Now matter how much I might enjoy a new recipe that I develop or come across as an adult, they never hold the same place in my heart as those I loved as a child. 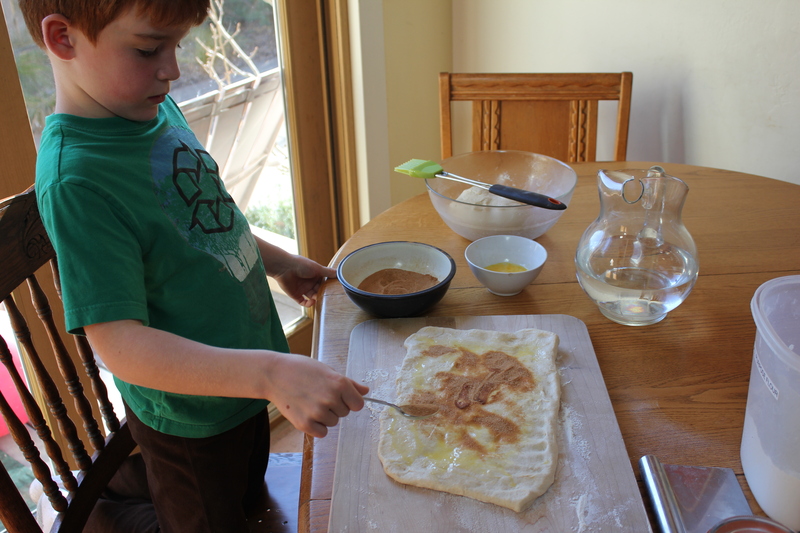 And also, without the enthusiastic blessing of my children, the recipe never will become a new family favorite. 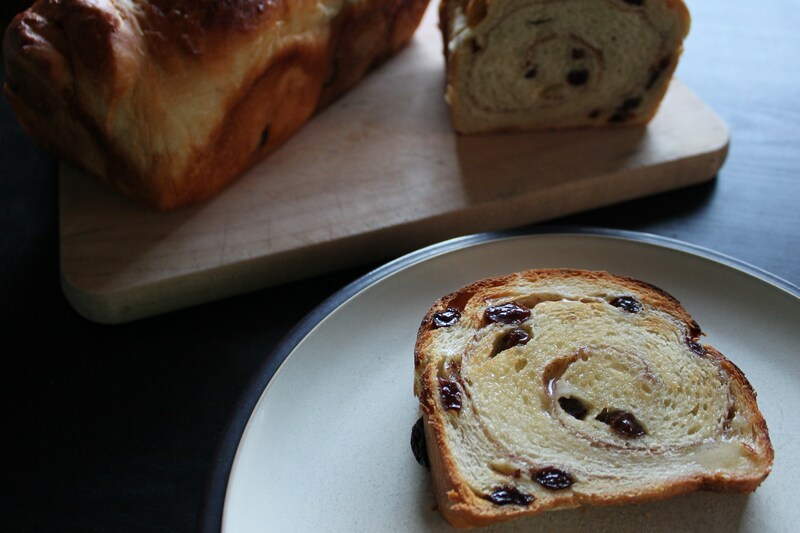 Grandma’s Cinnamon Raisin Bread is a not too sweet bread with a perfect cinnamon spiral through the center. 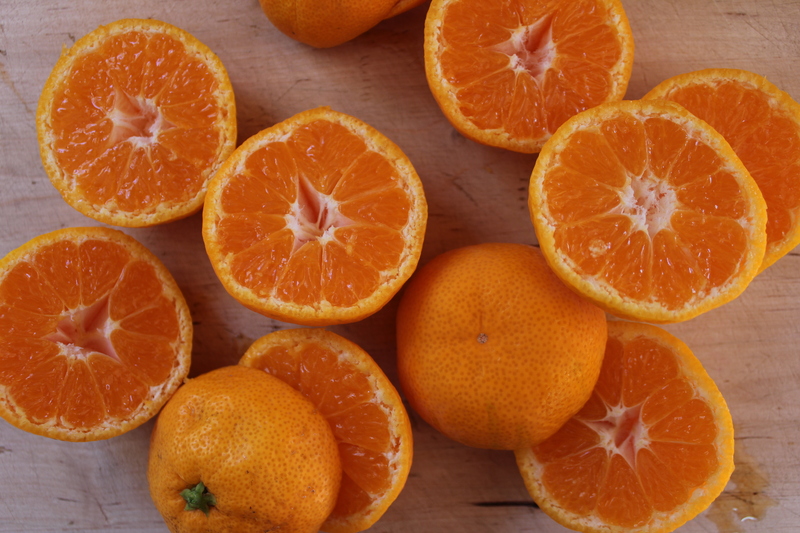 It is delicious on its own, but my favorite way to eat it is toasted with butter. It also makes a special French Toast. The recipe makes two loaves. The bread freezes well. 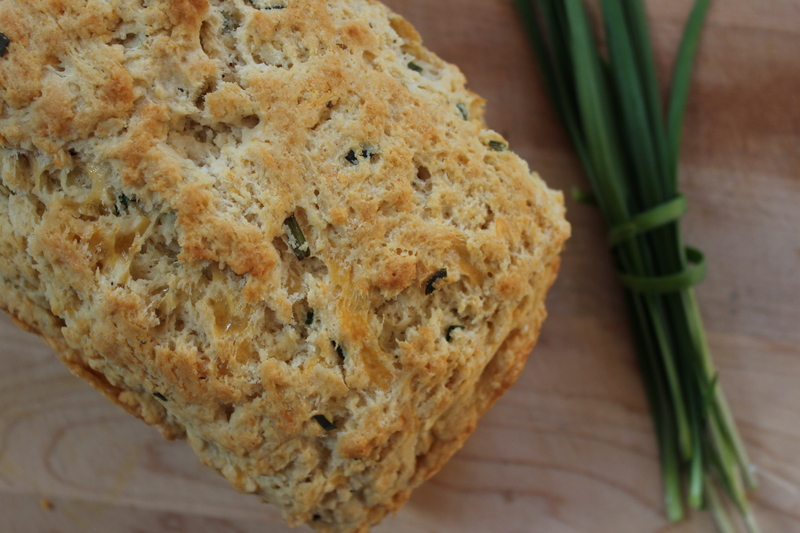 If you slice the bread first, it is easy to grab a slice to toast for an easy breakfast. So, what is your favorite family recipe? Tell us in the comments below and leave a link if there is one! This post was submitted to Yeastspotting.